Teenager Carter Wilkerson just dethroned Ellen DeGeneres' famous Oscar selfie for the most retweeted tweet. 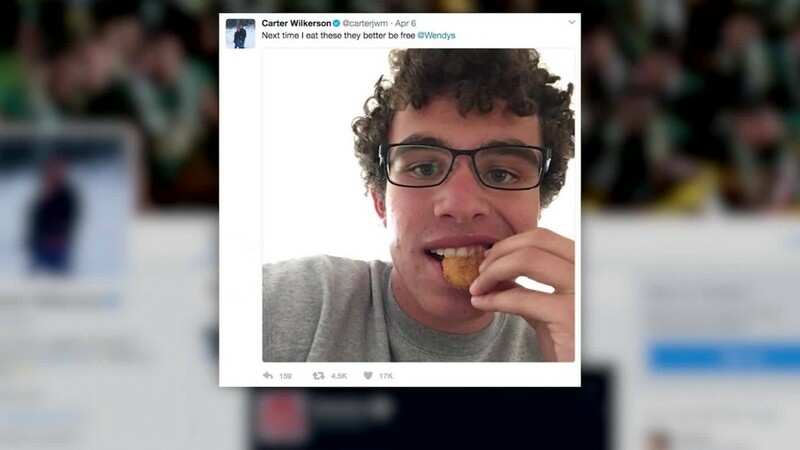 Last month, Wendy's challenged the teen to get 18 million retweets after he asked the fast-food chain via Twitter (TWTR) what it would take to get free chicken nuggets for a year. "Consider it done," Wilkerson tweeted back. His plea for retweets was shared nearly 3 million times in less than a week, receiving attention from tech giants like Amazon (AMZN), Microsoft (MSFT) and Google (GOOG). United (UAL) even offered to fly him to any Wendy's in the world if he reached the 18-million threshold. At last check, Wilkerson had amassed 3,432,218 retweets -- compared to 3,430,242 retweets of DeGeneres' selfie at the 2014 Academy Awards. Wendy's on Tuesday said it would give him the free chicken nuggets, despite Wilkerson not getting to 18 million. The company also said it would donate $100,000 to the Dave Thomas Foundation for Adoption, a Wendy's-affiliated nonprofit charity created by the company's founder, that finds permanent homes for children in foster care. As part of his campaign Wilkerson also created a website at nuggsforcarter.com, which sells T-shirts to raise money for the Dave Thomas Foundation. Wilkerson, who is from Reno, Nevada, told CNN last month he didn't think he would even get a million retweets. "At first, I didn't even expect them to respond," the teen said of Wendy's. Nor did he likely expect to unseat DeGeneres' tweet of a star-studded selfie from the 2014 Oscars, which previously held the record for the most retweets. Guinness World Records' official Twitter account tweeted a congratulatory message to Wilkerson for topping that record. The teen's father, J. Wilkerson, told CNN he's proud of his son for raising awareness and funds for the adoption charity: "He's really making this into something that's more than just chicken nuggets for a year -- he's making this into something that's helping." The teen said the experience has made him realize how quickly social media works and how big of an impact one person can make. "I have a voice now. It's good to use that voice," Wilkerson said.